Happy Healthy Long Life: Where Did I Leave My Glasses? So How Exactly Is Exercise Going to Help Me Find Them? If exercise could be packaged in pill form, it would immediately become the number one anti-aging medicine, as well as the world's most prescribed pill. 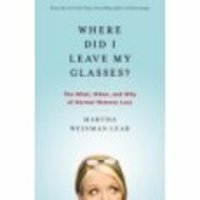 I first heard about Martha Weinman Lear on NPR, pitching her just published book, Where Did I Leave My Glasses? The What, When and Why of Normal Memory Loss. Martha's a former writer and editor of the New York Times Sunday Magazine, so when she started having what seemed like too much trouble remembering names and retrieving just the right words at the right time, she started doing her research. She was so concerned, that she visited a neurologist who put her through a battery of tests, assured her she was fine, and that what she was experiencing was the "normal and universal" slowing down of the brain in middle-age. As we get older it just takes longer to make judgments, grasp complex information and switch from one task to another. Isn't that encouraging? Multi-tasking doesn't work so well, after a "certain age". Talking on the phone, listening to the radio, eating breakfast and putting on make-up while driving...Don't try it! The conventional wisdom advises us to do crossword puzzles, learn a new language or a learn to play a musical instrument. The problem is, it's pretty hard to quantify the effects these activities are actually having on the brain. But here's the real encouraging news Martha uncovered during her research and interviews with 15 of the country's leading neuroscientists. There is a proven way to halt the "brain shrinkage" that starts in our 30's, especially in the parts of the brain responsible for memory and higher thinking. We can reverse the process with three hours of blood-pumping aerobic exercise a week. The blood flow increases and triggers biochemical changes that actually increase the production of neurons. Dr. Arthur Kramer, of the University of Illinois-Urbana, divided up a group of 59 adults, aged 60-79, into 2 groups & followed them for 6 months. One group participated in 1 hour of aerobics 3 times a week at a level of 60%-70% their maximum heart rate, which is pretty moderate. The other group spent 1 hour doing stretching and toning exercises 3 times a week. For a control group, he had 20 young adults, aged 18-30 years old participate in no exercise at all. Publishing in the Journal of Gerontology: Medical Sciences, Kramer found that "after only three months, the people (in his study) who exercised (aerobically) had the brain volumes of people three years younger." With just 3 hours of exercise a week the brain's volume increased significantly, and since our brains start shrinking in our 30's at a rate 1/2%-1% a year, the choice to exercise starts becoming pretty clear. It gets even better! Both the gray matter (the actual neurons) and the white matter (the connections between the neurons) increased. As a result, their "working memory" got better, they were sharper at switching between tasks (multi-tasking), and they were better at screening out distractions than the non-exercisers. How exactly does exercise "pump-up" the brain? (or should I say "plump-up" the brain?) Exercise increases the blood levels of a molecule called IGF-1 (insulin-like growth factor). It usually can't cross the infamous "blood-brain barrier", but magically, it does with exercise. Forget about non-aerobic training like stretching-and-toning. It didn't help. And as for the non-exercising 18-30 years olds in the control group, their brain volume also showed no significant increases. We still don't know yet if there's a benefit to exercising at a more intense pace. Stay tuned. Most recently, Dr. Kramer and his group, writing in the January 2008 issue of Nature Reviews-Neuroscience , "Be smart, exercise your heart: exercise effects on brain and cognition", examine the "positive effects of aerobic physical activity on cognition and brain function...". The next step they say "is to determine what are the best varieties, intensities, frequencies and durations of exercise" in regard to the brain and cognition. I've been exercising now for over 32 years and I still misplace my glasses! I've switched to contact lenses - now it's not a problem.